With weekend one of Coachella's 20th-anniversary celebration behind us, we look back at the most remarkable performance of the entire 2019 event - Aphex Twin's mind-melting 90-set. It was a majestic occasion for the die-hard electronic music fans who made the pilgrimage to the festival to witness the sonic and visual grandeur first-hand. Taking place at Coachella's Mojave Tent on Saturday, April 13, directly after Four Tet's jubilant and hugely popular performance (which you can listen to here), Richard D. James took the stage with visuals delivered by the anonymous artist Weirdcore for a sensory assault of epic proportion. 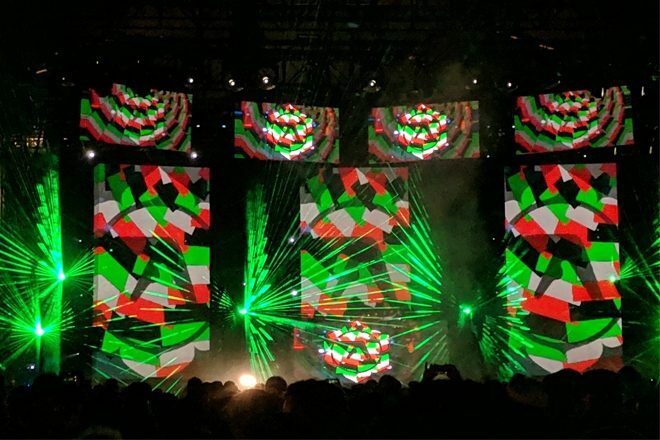 Thanks to a lone fan who took it upon themselves to film the entire set, you can watch Aphex Twin's weekend one performance from Coachella 2019 below. Aphex Twin recently performed his first NYC show in over 20 years. Check out our review of the event here.